As disciples of Jesus Christ we are called to share the love of God with the world, to carry Jesus’ message of grace, reconciliation, justice, and love to the ends of the earth. 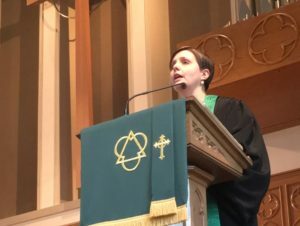 We are called to do as Jesus did, to stand with and for the marginalized, to give voice to the voiceless, to love the unlovable, and to continually expand our welcome of strangers and neighbors alike. We are called to share the gospel, to bring healing and be menders of the breach, to be peacemakers. These are not easy things. It’s a challenging call. Here in Mark, we find some practical helps, if you will. We find instructions from Jesus on how to go about answering the call or at least we find some first steps. We’re also told a little bit about what to expect on this journey of discipleship. What are the things you absolutely have to take with you when you’re packing for a trip? What are the things you can’t leave home without? Are you a bare minimum packer or a ‘ready in any event’ packer? How do you prepare to go on a trip? What makes you feel prepared? I don’t know if you’ve seen the movie or read the book Wild by Cheryl Strayed but a scene comes to mind. She’s going to hike the Pacific Coast Trail by herself and she’s never really hiked before. She loads up her back pack with every piece of camping/hiking/outdoor equipment she can and when it comes time to carry her pack for the first time, she can’t lift it. It’s too heavy. In order to get her backpack onto her back, she has to set it on the floor and sit down in front of it so that she can get the straps over her shoulders. It then takes monumental effort to get herself and the pack off the floor. All that she intends to carry weighs her down. She eventually runs into some seasoned hikers who help her weed out all that she doesn’t need and hear load becomes significantly lighter. They have wisdom to share because they’ve done it before. We need others to show us the ropes, don’t we? We rely on the wisdom of those who have gone before us in life. Jesus gives us a bit of wisdom here in Mark. As he sends the disciples out in pairs, he tells them to pack light. He tells them not to take anything extra with them. Such things will weigh them down. The implication seems to be that they already have everything they’ll need for their journey. And in the event they don’t have what they need, they’ll have to rely on others. They’ll have to rely on the kindness of strangers. They’ll have to be willing to ask for help. If they want a place to sleep, they’ll need to find lodging from someone who doesn’t mind that they can’t pay. If they want to eat, they’ll need to share a meal with others. They won’t be able to pay their way and they won’t have anything extra to sustain them on their journey. If they have any desire to be self-sufficient, Jesus squashes it. If they have any qualms about asking for help, Jesus says, “Too bad.” He doesn’t send them alone, though. He sends them out in pairs which tells me that they’ll need each other. They’ll need support, encouragement, perhaps someone to commiserate with when the going gets tough. They’ll share what resources they do have. The love and compassion they have to give will be multiplied by two. It seems we really aren’t meant to answer this call alone. There are no lone rangers in ministry. When it comes to this discipleship life and doing all that Christ has called you to do, what do you carry with you? When it comes to living as Jesus did, with and for others, what do you carry with you? What makes you feel prepared? I’ll guess that we think we need more than we really do. I’ll guess that we “over pack” when it comes to living out the call Christ has placed on our lives. Or it may be that we don’t ever begin the journey because we don’t feel prepared in the first place. According to Jesus, though, we have everything we need. In ministry I often encounter those who feel they have nothing to give, nothing to share, and nothing to offer. I gently disagree. Each one of us has something to give, something to share, and something to offer. We don’t need special credentials or training. We each have a story to share. We’ve been redeemed in and through Jesus Christ. We’ve been healed and made whole by the love of God. We’ve received grace time and time again. That’s what we share with others. That’s what we take with us as we do what Christ has called us to do. That’s all we need. When it comes to baggage, we all have some. We may not pack it or want to carry it but it comes with us wherever we go. We carry past hurts. We carry assumptions and judgments. We carry our certainty and our stubbornness. These are often the things that can weigh us down. These are the things that can make it difficult to go out as Jesus calls us to go out. These are the things that can make it difficult to live and do as Christ calls us to live and do. These things can slow us down or stop us in our tracks. And anything that hinders us from sharing God’s love or living as Christ calls us to live is something we need to set down and let go of. It may be a bag we need to unpack with the help of the Holy Spirit and a trusted someone or it may be something we just need to walk away from. Jesus suggests we travel light in this regard, as well. Sometimes there’s a voice accompanying us that tells us we aren’t capable or equipped. This voice tells us we can’t share the love of God because we don’t know the love of God. This voice tells us that we can’t offer healing because we aren’t healed and whole ourselves. This voice tells us that we aren’t good enough and don’t know enough. This voice is wrong. Self-doubt and second guessing are baggage, too, and they don’t get the last word. Jesus says that we are good enough and that we do know enough. Jesus says that we are capable. Jesus says that we have all we need. Jesus doesn’t need us to prepare ourselves for we can be used just as we are to do God’s work in the world. There’s an old saying…God doesn’t call the qualified rather God qualifies the called. We are called, make no mistake about that. We are called to share the love of God. We are called to offer healing and peace. We are called to reconciliation. We are called to do as Christ did, to stand with and for others, to give voice to the voiceless, to seek justice and peace. This is our call and according to Christ we are ready to answer it right now, just as we are. We already have everything we need to answer Christ’s call. As you preach and teach and live the way Christ calls you to live, it should raise some questions because it will go against the status quo. It’ll be countercultural and unusual. Jesus calls us to live differently, to go against empire, to transform the world with radical love and hospitality. People won’t always understand. Your family won’t always understand. The people that know you be the best won’t always understand. The choices you make as a disciple of Jesus Christ may be puzzling to those around you. You may be rejected or cast out or not invited to dinner anymore. Jesus says that’s ok. Just shake the dust off your shoes and move along. Don’t pick up extra baggage along the way. Don’t carry the judgments and assumptions of others. Leave them right where they are and keep going. As disciples we may be misunderstood and unwelcome particularly when we’re living out the gospel. Living as Christ did often makes those around us uncomfortable. Welcoming the stranger, standing for the marginalized, living as though the God’s love really is for everyone, these are not things that will necessarily make you popular everywhere you go. Jesus says to go anyway, to love anyway, to forgive anyway, to speak anyway, to listen anyway, to reach across the gap anyway. And I’ll emphasize again that Jesus says we aren’t to do all of these things alone. He sent the disciples out in pairs. He knew they’d need one another. We need one another, too. We have to rely on one another when things get tough and we get discouraged. This discipleship life isn’t meant to be lived alone. So we go out into the world, sharing the gospel at every turn. We rely on the kindness of strangers and the fellowship of our community to sustain us along the way. Travel light. Set down all that hinders you and shake the dust off your feet when necessary. Trust in the slow work of God and know that you are called, qualified by God and equipped along the way. All that you need to do God’s work in the world, you already have. And what you find you need will be provided along the way. Ask for help, rely on the kindness of strangers, be encouraged by the community of faith which surrounds you and know that above all God is with you.